He regretted tests take longer than one would want to. The Special Anticorruption Prosecutor's Office (SAPO) is preparing ask parliament for a permission to investigate MPs Andriy Lozovyy and Yevhen Deydey for illegal enrichment (Article 368 of the Criminal Code), Prosecutor-General Yuriy Lutsenko has said in an interview with LB.ua. He also described the details of a new criminal case against MP Oles Dovhyy, a former Kyiv city councillor. The SAPO closed the first case after running out of options to prove his guilt. "We open a factual case (against Dovhyy – Ed.) concerning not only one cooperative and funds allocated to him but everything that happened at that session of the Kyiv city council. It was a unique session, it was not reported whereas it had to be. Councilors had a blind vote. We will give a broader estimate. Because hundreds and thousands of hectares in the capital's natural reserves disappear, but no-one is guilty. 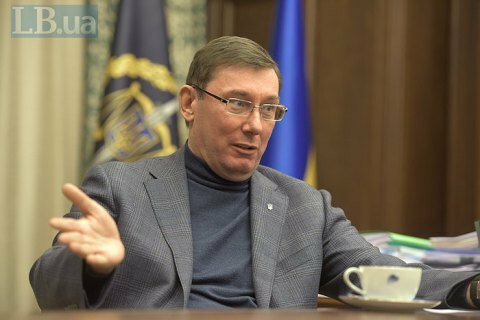 I don't agree to this," Lutsenko said. Asked why the case against MP Vadym Novynskyy had not been sent to court as announced a month ago, the prosecutor-general said another test was necessary. "The last test in Novynskyy's case is being completed… I'm not in charge of the test. Experts do when they do. The test in this case is being completed. And once it is over, we will file an indictment and send it to court," the official said. For the same reason, because tests are taking longer than expected, there is no progress in the case of a former head of the Kharkiv regional state administration, Mykhaylo Dobkin, he added. He also mentioned the notorious detention of Mykolayiv city councilor Ihor Kopiyka, a former member of the Party of Regions and currently of Opposition Bloc. "The party is of no importance here. I'm confident we have good evidence. The only problem, or maybe success, is that some want detentions to be immediately followed by prison terms. But this only happens in totalitarian countries. Any detention must be followed by investigation and then, unfortunately, by a long trial," he said.